Carbon Conversations with James Cameron: the first place for independent, in-depth, ideologically non-aligned news, views and opinions about sustainable finance and investing from a practitioner's perspective. For our first webinar of 2019, we are delighted to speak with Anna Hyrske, Head of Responsible Investment at Ilmarinen, and Carina Lundberg Markow, Head of Strategy, Asset Management and Sustainability at Folksam. This is an opportunity for businesses and firms worldwide to get an insight into their future challenges by learning from sustainable investing pioneers in the Nordic market. Participants will discuss the issues that are occupying their attention at the moment, as well as anticipating what the coming year may bring. - What can the rest of Europe learn from the market-leading Nordics? - What is your outlook for the year ahead? Which are the areas you are focusing on? - How can industry leaders meet their commitments with better data and analytics? Please send us any questions you have in advance to info@etindex.com. We will also have a live Q&A at the end of the webinar. An introductory guide to climate change and investment, this guide outlines the key trends that every investor should know. We describe relevant climate change drivers and metrics, how to understand a portfolio's climate exposure and the fundamental steps investors must take when formulating an investment response to climate change. Join us on the 18th October at 2pm to explore this guide with our CEO, Sam Gill, who will take you through our key findings and answer your questions relating to climate change and investment. In this webinar, we discuss the financial implications of climate change legislation and litigation with Richard Saines, Richard Lord and James Cameron. - Climate change and fiduciary duty, are they linked? Richard heads the North America Climate Change and Environmental Markets Practice at Baker McKenzie. He is recognised by Chambers USA and Chambers Global as a leading climate change lawyer. Richard has appeared in and advised on numerous cases in tribunals at The Supreme Court and House of Lords. He co-edited the book Climate Change Liability: Transnational Law and Practice. James has worked on climate change matters including the United Nations Framework Convention on Climate Change and Kyoto Protocol. He recently advised the Fijian presidency at COP23 in Bonn. With regulation to limit carbon emissions increasing worldwide, low carbon investment strategies are a hot topic among our members. 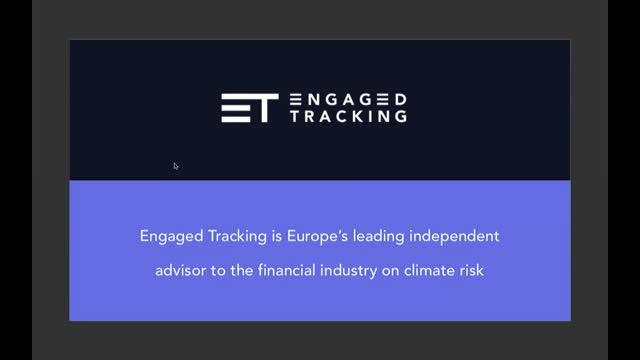 Research from Engaged Tracking has shown that investment strategies that ‘tilt’ away from carbon-intensive companies towards more carbon-efficient ones have been outperforming the market. This webinar will explore the recommendations from the Task Force on Climate-related FInancial Disclosures (TCFD) with a particular focus on how investors can implement scenario analysis. 1. Discussion of key trends in the market. 2. Learn more about what the TCFD recommendations mean for your organisation. 3. Gain insights from Engaged Tracking’s new TCFD-aligned scenario analysis tool. 4. Leverage insights from your peers in overcoming key challenges. 1. Learn more about key developments in the market that every fund manager needs to know. 2. Explore practical solutions for addressing climate change risk in pension portfolios, including responding to the TCFD recommendations. 3. Leverage insights from your peers in solving carbon-related investment challenges. - Key trends shaping climate change related financial risk. - How to perform scenario analysis. - Portfolio alignment strategies for a 2°C global warming pathway. For asset owners and asset managers who want to better understand the investment risks and opportunities across asset classes in the transition to a low-carbon economy. In this webinar, industry experts and investors will examine innovative tools and metrics for accelerating the transition to low-carbon and sustainable investment across asset classes. Global family offices and high net worth individuals have over US$50 trillion in assets to deploy. By 2025, this asset volume is expected to surpass US$100 trillion. This group represents a powerful force for good in the financing of climate solutions and the transition of the financial system towards low-carbon investments, across all asset classes. This webinar will explore low-carbon investment strategies for private investors in the context of a market transition away from fossil fuels and the economy-wide decarbonisation targets reaffirmed in Marrakech. Leading private wealth advisors are increasingly being asked to measure the impact of their strategies on climate targets, and to incorporate climate value creation metrics into their investment decision-making. • How family office investors and their advisors can protect their portfolios through the low carbon transition and use strategic capital deployment to accelerate an economy-wide transition. • What impact private wealth investment decisions mean for the future of climate change policy action and the market-based transition away from fossil fuels. For asset managers, asset owners, NGOs and academics interested in leading thought leadership around low carbon and ESG investing.